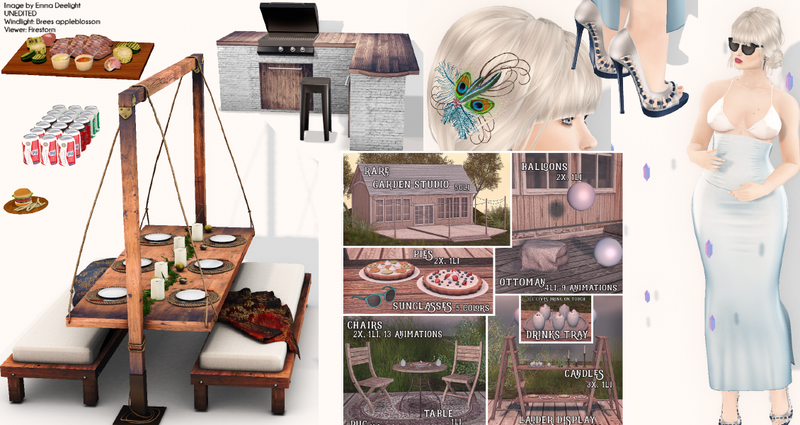 Today I am featuring EMO-tions, Kaithleen's, Raindale, Monkey Banana, Chez Moi and Fiasco @ Cosmopolitan. Plus Hilly Haalan and The Little Branch @ Hello Tuesday. The anniversary round of Cosmopolitan has just started. There is an outstanding lineup of designers and there are gifts to be found. Make sure you check it out soon. I am wearing hair from EMO-tions. This cute lil style has a peacock feather add on. The latex top and skirt are from Kaithleen's. They're made for Belleza, Slink and Maitreya. The fatpack includes 14 colors. I am pictured with a handful of items from the Ellesmere gacha by Raindale, including the rare house. 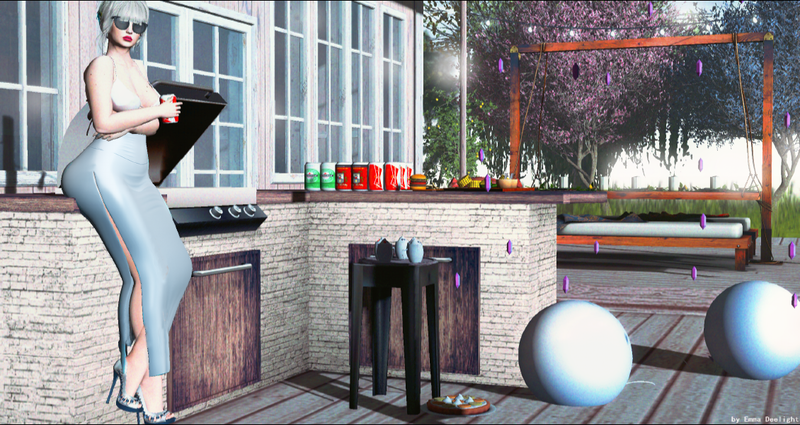 I've added a handful of items from the BBQ gacha by Monkey Banana to create the outdoor party look. For all items used, please see below. I finished the scene with the table setting from Chez Moi. It has room for up to 6 people and comes with +75 animations in PG version and +135 animations in Adult version. This set is 20% off during the event. Lastly I have used the floating crystals from Fiasco. Hello Tuesday deals are also here. Save 50% or pay only L$50 on select items from the stores surrounding the main event building. The shoes are from Hilly Haalan. They're made for Belleza, Slink, Maitreya and include a 25 color HUD. THe purple and blue trees pictured in the background are from The Little Branch. I hope you enjoy today's outdoor party look.